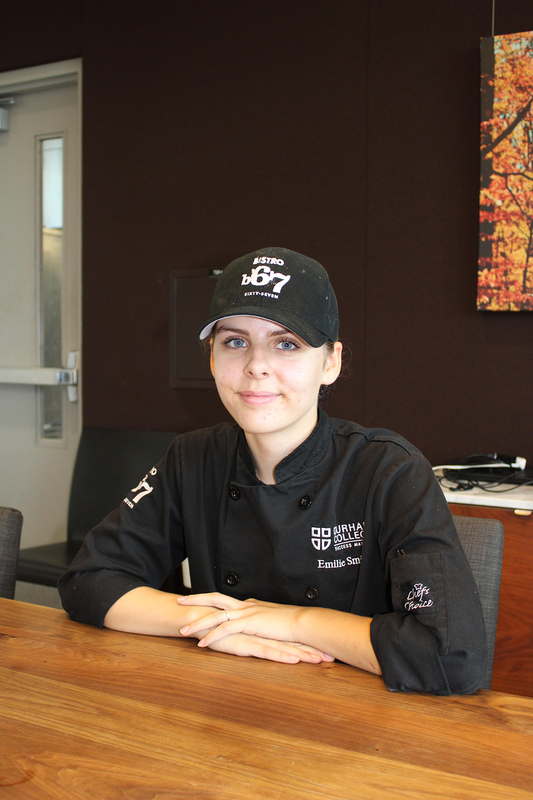 Emilie Smith, Durham College Culinary program graduate and current Bistro '67 employee, says she is excited to create some new menu items. Durham College’s Bistro ’67 offers an exclusive culinary experience with unique food creations, where hybrid fruit to earth-inspired desserts are available for guests. Bistro ’67 is the school’s restaurant located on the Whitby campus, which serves as a hands-on learning environment for culinary students in the W. Galen Weston Centre for Food. It appears to be a hit with the paying public. Trip Advisor awarded Bistro ’67 with the certificate of excellence and is ranked as the second most popular restaurant in Whitby out of 235. Employees are encouraged to take initiative in creating original offerings. 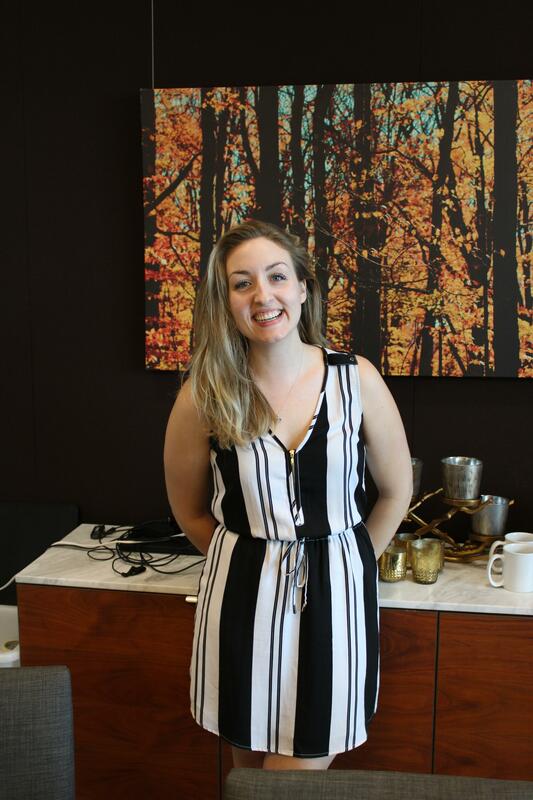 Emilie Smith, a Durham College graduate from the culinary management and advanced baking and pastry programs, as well as a current Bistro ’67 employee, says she wanted to incorporate earthly flavours to the menu. Smith says the kale cake on the dessert menu is earthly and green, but sweeter. Smith credits a co-worker with inspiring her creativity. Kristen Atwood, who was once a part of the Bistro ’67 team, showed Smith a cookbook that described a recipe for chocolate stones. This recipe inspired her to create a dessert reflecting the true essence of being outdoors. Smith created the soil out of sour dough that has a sour background taste. She topped the soil with smoked nuts and almonds with dried fruit, then toasted it in the oven. The dessert was finished with cinnamon and nutmeg. Smith says she is currently working on new menu items that incorporate tree bark and to produce something that looks exactly like a log. This past summer, Bistro ’67 also experimented with harvesting hybrid fruit. Tiala Arsenault, event coordinator at Bistro ’67, says the restaurant aims to offer an educational experience to students, as well as helping guests create fond memories with their families. Tiala Arsenault, event coordinator at the Centre for Food, says Kaitlyn Dover, service manager, found the idea for cucamelons, a hybrid fruit from Mexico, from Pinterest and other social media platforms. She thought it would be an interesting project for Bistro ’67. The mini-sized fruits have the skin of a watermelon, but taste like cucumbers. Arsenault says students have experimented with other interesting culinary creations such as beet sorbet, edible flowers or putting an original twist on the traditional cheesecake. In addition to the full, sit down restaurant experience, the Centre for Food offers an onsite grab-and-go culinary experience. Through an outlet called The Pantry, the public can purchase items such as spicy chocolate cookies, Coke Zero doughnuts and frozen protein smoothie packs. The facility, which opened in fall, 2013, integrates both a learning environment for students and a functioning restaurant with paying customers. The restaurant prides itself on its “field to fork” doctrine, says Arsenault.